What exactly is meant by the term “Effective Emission Height (EEH)”? It is often used to explain the greenhouse effect because, it is claimed, increased CO2 levels will raise the EEH to a slightly colder level, reducing OLR, and thereby “forcing” a surface temperature rise in order to restore energy balance. EEH is essentially some imaginary height in the atmosphere approximately where the temperature matches the effective temperature of Earth (255K). This is because a hypothetical black body at this temperature would produce the necessary 240 watts/m2 – to balance incoming absorbed solar radiation. However the EEH still has no real physical meaning since radiation is escaping to space from all heights in the atmosphere, and also from the surface. Figure 1 shows the main sources of IR radiation reaching space, as least as far as I see it. Fig 1: The main sources of IR photons escaping to spaceA) Infrared window clear sky and via clouds. 2) Greenhouse gas emissions throughout the atmosphere dominated by H2O and to a lesser extent CO2. The figures in watts/m2 are described in the text. The Trenberth energy balance diagram actually uses 30 watts/m2 for cloud top radiation. If you prefer this value then add the extra 20 watts to H2O radiation. The surface radiates photons directly through the Infrared window in clear skies or via cloud tops otherwise. The IR window spans wavelengths 8.5 – 13.5 microns with a small ozone absorption band in the middle. The total average flux through the window is calculated to be currently ~99 watts/m2 but some will be absorbed and then re-emitted through clouds thereby losing some energy in the process. The values displayed in figure 1 are in watts/m2 and are based on the paper by Kiehl & Trenberth . 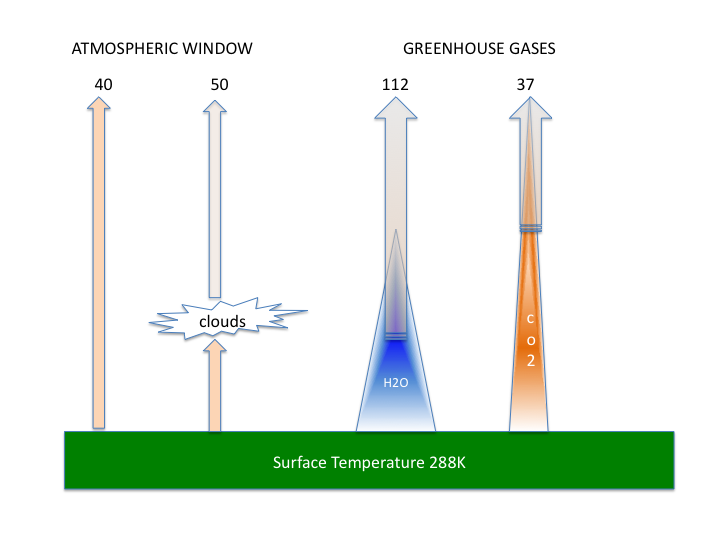 The IR window must act as a negative feedback to any rise in surface temperature since the flux through the window increases as T^4, independent of greenhouse gases. It is like pumping air into a tyre with a puncture. The harder you pump the faster the air escapes. The second way the planet cools to space is through radiation by greenhouse gases in the atmosphere. The atmosphere gets roughly 2/3 of its heat through convection and latent heat and about 1/3 from radiative transfer. Together they maintain the lapse rate at ~ 6.5deg/km and kinetic energy is thermalized at each height. The simple greenhouse model described previously showed that currently about 37 watts/m2 are radiated to space by CO2 in the Earth’s atmosphere. The rest ~ 112 watts/m2 is radiated by water vapor mainly in the lower parts of the atmosphere. At what height in the atmosphere does CO2 radiate then directly to space ? I have investigated this by calculating the net energy radiated directly to space using the model. For each 100m wide level in the atmosphere I calculate which fraction of the radiation makes it out to space without being absorbed. There are two effects determining this which work against each other. The lower levels are warmer, contain more net CO2 molecules and therefore emit (and absorb) higher fluxes of 13-15 micron photons. The higher levels are thiner and more photons from below are transmitted through it. However they are cooler and emit less photons even though there is a higher probability they reach space. 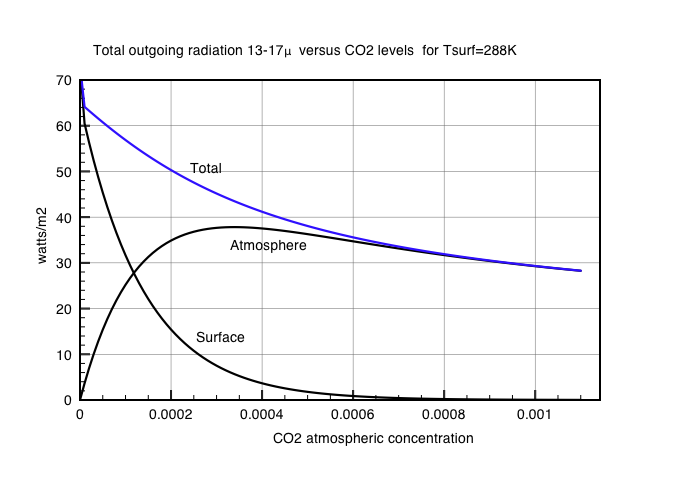 By calculating the flux of radiation to space from each level we can visualize the “effective height of emission” for different CO2 concentrations in the atmosphere. The result is shown in Figure 2. Fig2: Radiation flux height profiles for 100m wide layer due to CO2 molecules at different concentrations. All profiles are calculated for Ts=288K and lapse rate = 6.5K/km. The numbers correspond to total atmospheric outgoing radiation flux. It is clearly seen that the peak emission height moves upwards as CO2 concentrations increase. However the total energy radiated to space changes only slightly. It falls by 2.7 watts/m2 increasing CO2 levels from 400ppm to 600 ppm in this simple radiation model. The AGW argument is that the surface temperature will then increase slightly to compensate. However this does not seem to be completely true at higher levels of CO2. To investigate this I calculated how the change in outgoing 13-15 micron radiation from the atmosphere varies with CO2 level for a fixed surface temperature of 288K. Figure 3 shows the result. Note that as the CO2 levels fall to zero the IR window would actually increase to slowly include the CO2 band. This is because the surface radiation directly to space dominates for CO2 levels less than ~100ppm. Fig3: Change in atmospheric OLR with CO2 concentration for fixed surface temperaure 288K. The peak for atmospheric OLR occurs for ~ 300ppm which just happens to be that found on Earth naturally. Can this really be just a coincidence ? It is almost as if convection and evaporation act to generate a lapse rate which maximizes radiation cooling by CO2 to space. If this conjecture is true in general, then any surface warming due to a doubling of CO2 levels would be offset somewhat by a change in the average environmental lapse rate to restore the radiation losses in the main CO2 band. In this case the surface temperature would hardly change. More fundamental is the question – what causes CO2 concentrations to be ~300 ppm in the first place ? Maximum entropy increase is ensured by maximum radiation loss to space and for CO2 today that just happens to coincide with 300 ppm ! Could it really be possible that planetary thermodynamics drives the carbon cycle ? updated 5/1/13 to show surface and total OLR in Figure 3. This entry was posted in AGW, Climate Change, climate science, Science and tagged AGW, CO2, greenhouse, Models. Bookmark the permalink. That’s what a good deal of the argument is about. The forcing due to CO2 is assumed to operate while the surface temperature stays constant. Yet the water vapour feedback which is assumed to amplify the CO2 forcing obviously requires higher surface temperature to evaporate the water. Confused? This is the sort of illogical reasoning that drove me deeper into scepticism. The “effective emission height” is of course meaningless in real terms. It’s around 5000m at the equator, which is equivalent to some 3848m below the summit of Everest. Claes Johnson however thinks that LWIR emission to space actually emanates from that height which he refers to as TOA – a height that has slightly more than half of the mass of the atmosphere above it. I very much like the argument made by Claes Johnson. On Venus the lapse rate is close to the DALR or 10.5 deg./km. The TOA is about 50 km above the surface and Teff= 260K . This then determines the surface temperature of ~ 700K, agreeing with measurements. Without 70% water coverage, the lapse rate on Earth would be 9.8K/km so with TOA at 5km the surface temperature would then be 304K. Instead “thermodynamics” mainly by evaporation and latent heat cools the surface reducing the lapse rate to 6.5K/km resulting in the measured surface temperature ~288K. He is arguing that if the solar energy increased by say 4 watts/m2 then thermodynamics would offset any temperature increase, as it clearly already does. So the temperature rise would be just 0.3K. This is the climate sensitivity for doubling CO2 as well using the same “radiative forcing” argument. neat ! and has the advantage of actually agreeing with measurements unlike the IPCC ! Thanks for this Clive. Will need to study it more. I recently learned that N2, O2 and Ar cannot radiate IR at temperatures found in the Earth’s atmosphere. Therefore, at and above the tropopause, where water vapour is vastly reduced because of the cold, CO2 will continue to radiate down to -80C (193K). Also I read that IR emissions from around the 300mb level can escape directly to space due to the low molecular density of the atmosphere at and above this altitude. This looks to me like the escaping radiation is from a huge VOLUME of the upper atmosphere. How this relates to watts per square metre, a two dimentional surface, has me flummoxed. When they talk about watts per square meter from a large volume of the atmosphere, they really mean the flux per square meter going through some imaginary spherical shell surrounding the top of that volume. Although it is true that CO2 molecules continue to emit IR down to 193K, the density of molecules are so tiny up there that they have little net effect on cooling the planet. 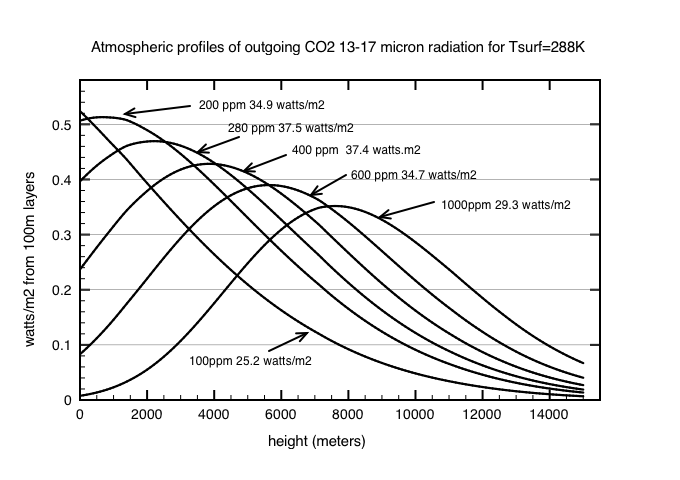 As figure 2 shows above outgoing CO2 radiation peaks at around 4000m altitude. That is well below the summit of Mont Blanc (4800m) ! N2, O2 and Ar must emit tiny amounts of black body radiation during collisions at temperature T. But the amounts are insignificant compared to water vapour and (to a lesser extent) CO2. Your final question – “Could it really be possible that planetary thermodynamics drives the carbon cycle ?” – reminds me that Piers Corbyn says that temperature changes lead CO2 changes by approx. 800 years. ( See e.g. http://www.weatheraction.com/docs/WANews11No5a.pdf – 6th and 7th slides. ). So can you think of a mechanism that would involve a time delay of 800 years ? Obviously at the end of an ice age, as the ice melts more biomass becomes present on the exposed surface. Could that be something to do with it ? As the oceans warm so disolved CO2 out gasses – just like warm beer goes flat overnight. The primary driver of Ice Ages are thought to be Milankovitz cycles. CO2 levels then respond to changes in sea surface temperature – perhaps with an 800 year delay. What determines what the optimum CO2 concentration of the atmosphere ? I think it cannot be a coincidence that the natural level of CO2 coincides with the maximum radiation loss by the atmosphere. So 300 today and 240 during the last glacial maximum. Why this should be the case on Earth but not on Mars I don’t really know. However, one big difference is that the Earth has water and life. Oxygen levels and to some extent CO2 levels seem to be controlled by life. So maybe Gaia theory is correct ! Incidentally I used to be a firm “believer” in AGW. In 1996 I wrote the software to analyse ECMWF global weather data covering the previous 12 years for Marine Environment group. It was on more than 20 magnetic tapes stored in some binary format called GRIB. I averaged the temperature data and confirmed a small global temperature rise. The data even showed a year long cooling from Mount Pinatubu ! The greenhouse effect is a scientific fact, however global warming predictions are not. What has become clear to me since is that the science has now been hijacked by politics and economic interests. It is highly improbable that CO2 is the primary driver for Earth’s climate. There has been no warming for 17 years. I is difficult to get this message across because so much political and economic capital is now riding on the AGW narrative. Always more to think about from your answers, thank you Clive. The idea that there is some small amount of blackbody radiation from inter-molecular collisions in non-radiative gases seems reasonable but the question remains – how much? Will try and find it myself. Ocean absorption of CO2. I read there is some 50 times the volume of CO2 in the oceans compared to the atmosphere and the rate of absorption is dependant on ocean temperature. But ocean temperature seems to be mostly a surface effect, the SST. It seems to me only small volumes of the ocean are consistently interactive with the atmosphere, temperature wise. But what about the thermohaline currents? Here is a mechanism (?) that could provide long term sequestration of CO2 and might account for the 800 year rate of reduction. Emission back into the atmosphere could be from the upwelling sea currents. Thanks for your extensive reply, and for reminding me that there are oceans in the system too! So at the end of an ice age there is more outgassing of CO2 from the oceans both because they are warmer and because there will be a greater surface area. Then we have the rainfall dissolving some of the CO2 and taking it back out of the atmosphere. On the other hand there will be a growing amount of biomass on the increasing surface of exposed land which will fix some of the carbon, and as mentioned by Richard111 the thermohaline currents…. I guess all these effects have to be quantified to get the proper picture. I will go away and read about Gaia – and might be gone for some time ! Meanwhile your fig. 3 does seem to be very significant indeed with the broad peak around the 300 ppm value. Consider the 3 “windows” (atmospheric , H2O and CO2) : their individual total OLR’s are all determined by the temperature at their effective heights. Now assume that the OLR via the CO2 window changes (lowering) by , say , 3.5 W/m2 due to doubling CO2. Therefore the temperatures at all levels in the atmosphere will increase slightly (with the same %) and affect all windows with a slight increase in their OLR till the total OLR is back to 239 W/m2. In other words , the change in one window impacts all other windows and make them to contribute to the balance because they all have a common feedback element : temperature. This means that the increase via the CO2 window only needs to be 37/239 = 15 % of 3.5 W/m2 = 0.5 W/m2 to get back to balance since all other windows contribute as well. Therefore the temperature increase (assuming 1° C if balanced via CO2 window only) needs only to be 0.15 °C. Obviously , a change in H2O in the atmosphere will also create a change in CO2 OLR. This is parly what climate scientists call the ‘Lapse rate’ feedback. It is in general a negative feedback because although CO2 increases the tropopause slightly, there is more evaporation which reduces the lapse rate. Therefore it acts to reduce the temperature of the effective emission height for CO2. And yes – any change in H2O content would also effect the CO2 GHE. They are all related. In fact I don’t think CO2 is a ‘driver’ of climate at all. It has never changed the climate on earth in the past. CO2 is usually a feedback to other forcings like the sun or orbital changes. It increases the warming effect and increases the cooling effects on earth. Aolert from now and perhaps also the PETM event CO2 has never by itself driven climate change. Yes, both. The very high level of free oxygen and very low level of CO2 in the Earth’s atmosphere are because the Earth is a living planet. On Venus and Mars nearly all the oxygen in the atmosphere is in the form of CO2. O2 is nearly non-existent, because it is highly reactive, and combines with other elements to make less-reactive, more stable molecules, like CO2 and H2O. But on Earth, other than some water vapor, more than 99% of the oxygen in the atmosphere is in the form of O2, and only 0.2% is in CO2, despite fires and animal respiration which constantly produce CO2 from O2. The reason is that CO2-hungry living things have stripped nearly all the CO2 from the atmosphere, to get the carbon, releasing the O2 as a waste product. That’s why, although 21% of the Earth’s atmosphere is oxygen, CO2 levels are measured in mere parts-per-million. The CO2-O2 balance is determined mainly by a tug-of-war contest between plants and animals. Animals use O2 and produce CO2; photosynthetic plants use CO2 and produce O2. But step outside and look around: how many plants do you see, and how many animals? The plants outnumber us, so in the CO2-O2 tug-of-war the plants have tugged the rope all the way to the end. They’ve used up nearly all the CO2. The outnumbered animals just can’t produce enough CO2 to keep up. The plants would use even more CO2, but it ran out. The chronic shortage of CO2 in the Earth’s atmosphere is the primary limit on plant growth. That’s why anthropogenic CO2 emissions, which have accounted for an increase in atmospheric CO2 from about 0.03% in the 1940s to about 0.04% today, are directly responsible for at least 15% of current agricultural productivity, and why CO2 fertilization (“greening”) is a major negative (stabilizing) climate feedback mechanism. Glad you finally got your comment through! I think I agree with everything you write above. In addition enhanced CO2 ‘warming’ will probably avert the next ice age which otherwise was due to begin within the next 5000 years with far more catastrophic effects for humankind than a couple of degrees warming.